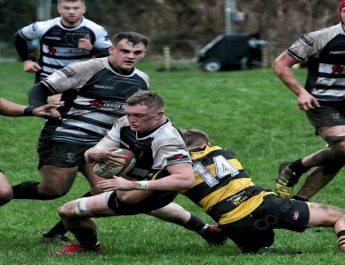 Cross Keys’ hopes of maintaining their Principality Premiership status in to next season were dealt a big blow last Saturday as they suffered a crushing defeat at Parc Y Scarlets against fellow strugglers Llanelli, who ran out comfortable 53 points to 12 winners. It took the home side a little over 5 minutes to open the scoring after prop Simon Gardiner went over for a try out wide following a close range driving penalty after Keys conceded a penalty just 5 metres from their own try line. Scrum half Declan Smith failed to add the conversion from out wide. The home side crossed for their second try with 10 minutes on the clock when from a scrum formed on the Keys 22, centre Jonny Lewis picked a good running line which saw a big gap being exploited in Keys’ defensive line. 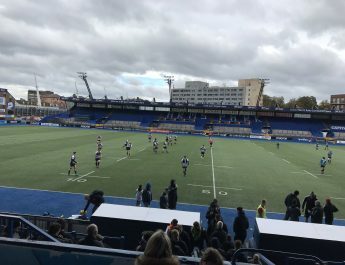 Lewis then had scrum half Declan Smith on his shoulder in support and he did the rest to cross to continue his side’s excellent start, Smith however again failed to add the conversion from the opposite touchline to his first attempt. Llanelli’s third try came after Keys’ scrum half Dan Babos found himself under pressure in possession in the Keys’ 22. Babos threw a loose pass, just as he was about to be bundled in to touch and the loose ball was pounced upon over the try by Llanelli scrum half Declan Smith who reacted quicker than Keys’ scrambling defence as he grabbed his second try of the game with 20 minutes played, Smith again failed to add the extras to his own try. With Keys still yet to create any clear opportunity, the home side’s 4th try and subsequent bonus point came with just 29 minutes on the clock when patient build up play eventually led to loose head prop Rhys Fawcett, who recently had a spell on loan with the Dragons was worked in to space and crashed over for a try which Smith this time converted. The Keys finally got off the mark with 35 minutes played when outside half Carwyn Penny put Keys on the front foot with an impressive break up the middle of the park from his own 22, to launch what was probably Keys’ first real attack of the match. He offloaded out wide to Rory Budina, as he crossed the halfway line with Keys staying on the front foot thanks to Budina’s run before the ball was moved back in field and another show and go from Penny saw him race clear in to the Llanelli 22 and with just one man to beat Penny had Dan Babos on his shoulder and the scrum half did the rest to score the try under the posts which Penny duly converted. With 2 minutes of the first half remaining Llanelli crossed for their 5th try when, the won a turnover in midfield and spread the ball out wide. Llanelli wing Kalum Evans carried over the half way and his pass back inside, which only appeared to be a few yards forward sent centre Ryan Davies away and he crossed for a try to the right hand side of the posts. Declan Smith’s conversion was good as Llanelli move in to a commanding lead at the break. It took just over 6 minutes of the second half for the home side to score again when centre Ryan Davies crossed for his second try of the game out wide. With advantage being played in Llanelli’s favour a speculative kick through behind Keys’ defence and Davies followed the kick through and picked up the ball to cross easily in the corner, with Keys seemingly waiting for the whistle to be blown for the penalty against as Llanelli played the advantage well to cross for the try. Declan Smith again failed to add the extras from out wide. The next (7th) Llanelli try came with around 15 minutes remaining when centre Ryan Davies bounced off the would be tacklers all too easily to complete his hat-trick after good handling across the line put the home side in to a position to score. 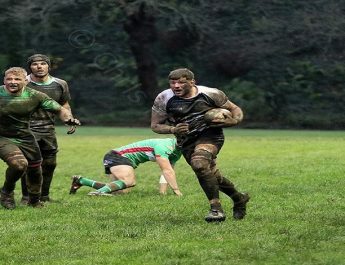 Replacement Ioan Hughes added the extras from the left of the posts. The 8th Llanelli try came when the home side secured possession from their own throw just inside the Keys’ half and put width on their play once again. A break from wing Liam Hutchings saw them race away from Keys’ chasing defence and his pass to replacement Leon Randall was timed to perfection and Randall did the rest to score the try with a little under 10 minutes left on the clock. The conversion attempt from out wide was once again off target. 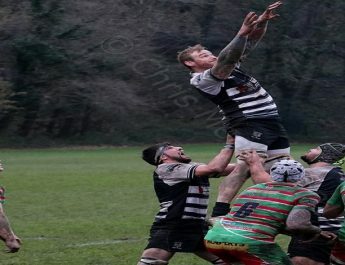 The Keys responded immediately from the restart when replacement Iwan Burgwin intercepted a stray pass and raced away from the Llanelli 22 metre line to cross for a consolation try with around 8 minutes remaining. Carwyn Penny failed to add the conversion from the right of the posts. Llanelli weren’t done and bought up the 50 points with 3 minutes to go when replacement Joel James went over after the home side had dominated a scrum, a familiar story for the afternoon which put them on the front foot inside the Keys’ 22 and allowed James to find himself in space to score his side’s 9th and final try of the game. Ioan Hughes added the extras with play now entering the closing 2 minutes. Overall The Keys should have seen this as an opportunity to claim a crucial, moral boosting victory against a fellow relegation-threatened side but instead the Keys were outclassed in every aspect of play and perhaps the most disappointing thing is the basic, unforced individual errors which cost Keys dearly throughout the game. The Keys are not down yet but unless there is to be a big improvement in both general play and also attitude then the Keys’ spell in the Principality Premiership will be a thing of the past for the time being!